Also known as Chinese noodles, glass noodles or cellophane noodles, mung bean noodles are transparent, dehydrated strands made from mung bean starch. The noodles are boiled to rehydrate, and then often added to Asian soups, spring rolls and stir-fries. Though they aren't an impressive source of most nutrients, they do provide a good dose of a few, as well as trace amounts of several others. A cup of dehydrated mung bean noodles contains 491 calories and only a trace amount of fat. However, the noodles are quite high in carbohydrates, with 120.5 grams. If you're trying to shed excess pounds or are trying to maintain your current weight, take the high calorie and carb counts into consideration when planning your daily meals and snacks. Another drawback is that mung bean noodles have less than 1 gram of fiber in a cup. There are about 3 milligrams of iron in a cup of dehydrated mung bean noodles, which translates to 38 percent of the 8 milligrams of iron men require on daily basis and 17 percent of the 18 milligrams women should have each day. Iron moves oxygen around in your body, and it plays a role in the production of energy. Although it's not a significant amount of zinc, that same portion of mung bean noodles has 0.57 milligram of the mineral, which is 7 percent of the 8 milligrams women need each day and 5 percent of the 11 milligrams men require on a daily basis. Zinc protects your cells from damage and helps with wound healing as well. Mung bean noodles are a good source of choline, which your body relies on for healthy cell membranes. Choline helps protect the structure of the cell membranes and aids the cells in proper signaling, according to an article published in 2007 in "Nutrition Today." Some choline is metabolized to produce acetylcholine, a neurotransmitter that plays a role in memory and mood and also promotes normal heartbeat and breathing, the article also notes. The amount of choline you need depends on your gender. 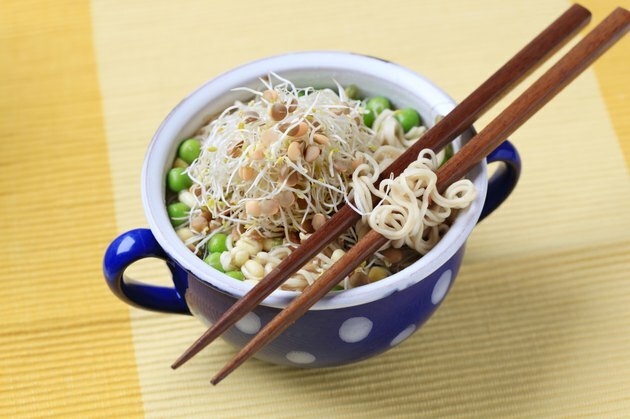 A cup of mung bean noodles contains 93 milligrams of choline. Soak dehydrated mung bean noodles for about 15 minutes in hot water, and then boil them for approximately 1 minute. Once they've been cooked, add mung bean noodles to Asian soups, such as pho soup, and any meat or vegetable stir-fry. Chop cooked mung bean noodles into small pieces and scatter them over a salad or serving of fried rice. Mung bean noodles will also enhance the flavor of your favorite pad thai recipe. What Are the Health Benefits of Kelp Noodles?